May is National Military Appreciation Week and snack maker Kind wants to send soldiers and veterans very special thank you notes. 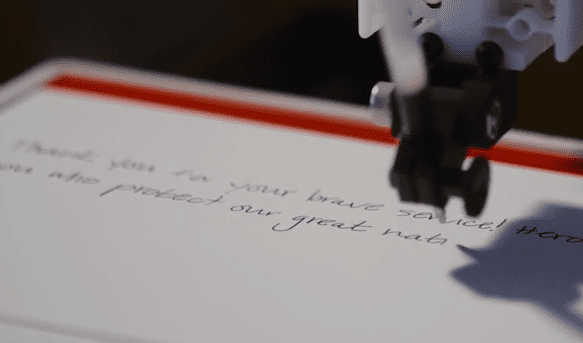 Using a robot with impressive penmanship from tech startup Bond, Kind will convert thank you tweets into handwritten notes and deliver each one to an armed service member and veteran. Compose your own tweet to show your appreciation for the armed forces and add the #thankskindly to have the robot handwrite the message. Twitter users can compose a thank you message in 140 characters or less and add #thankskindly to have the robot choose from one of a thousand handwriting styles to write it. For every tweet received, Kind will donate $1, up to $10,000, to Cell Phones For Soldiers, a nonprofit that provides active service members and veterans with cell phones and calling cards. The campaign runs through the end of May and the goal is to raise $10,000.